Rippon then momentarily took first in the men’s individual short program hours later. Rippon was immediately passed for first in the event, but his technically sound, energetic program impressed judges. 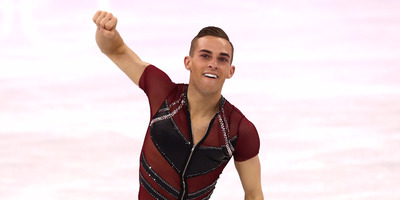 Adam Rippon has become a star in the Winter Olympics just as much for his bubbly personality as for his figure skating. The 28-year-old US skater has won over audiences with his charisma and sense of humour, which he even says is his strong suit. In an interview with NBC on Friday in Pyeongchang, shortly before competing in the men’s individual short program, Rippon gave an honest interview in which he said he knew he was not the best skater at the games – but was the most fun. It was an honest answer, with Rippon’s typical humour, that won over even more fans. And then Rippon took the ice – and placed first, at least momentarily. Rippon’s score of 87 vaulted him into the lead, but he was passed immediately after by Dmitri Aliev, of Russia, who scored a 98. Rippon never stood much of a chance in the event because he doesn’t have any quads in his routine. Judges award points for risk and difficulty, and Rippon’s program doesn’t have the most difficult trick in the sport. Still, as NBC’s Johnny Weir and Tara Lipinski said on the broadcast, Rippon “wills” himself into competition with near-perfect execution for what he does. He’s technically sound and energetic. Ultimately, Rippon seems unlikely to medal individually, something he knows. But for somebody who doesn’t consider himself the best, he momentarily topped the event and impressed judges even without the best jump.